What Software Do You Use To Design Timber Frames? May i know what kind of software do you use for designing Timber Frame ? I am a student , i am learning timber frame home design .. hopefully i can get some suggestion from you ! We use CadWork for our software. It is very powerful, but there is a learning curve. I think they have student versions available. 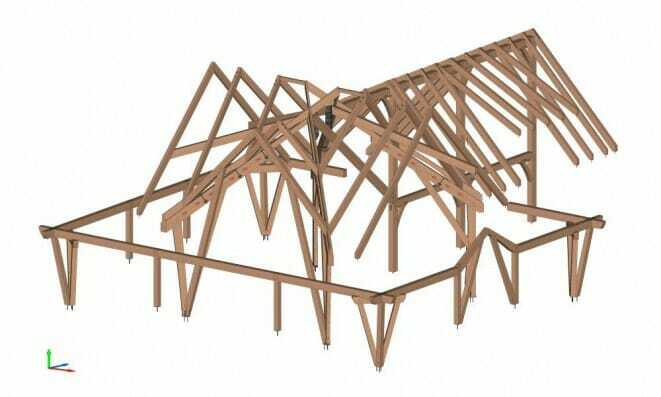 What is the use of Plate Girder in the Roof Trusses? What is the longest distance allowable between two hammer beams? How Do I Account for the Capital in Calculating the Capacity of the Main Beam? What Product Do You Suggest to Preserve/Treat Wood? What Are Good Connections For A Skillion Roof Patio? How Do you Protect Timber and Joints Exposed to Weather? What is the Minimum Size Post for a Post Base with a Steel Rod? How Big a Concrete Pad Do I Need for Oak Posts? Can you Pour Concrete Around a Timber Post?